When I joined the Droogs in 2016 I didn’t know much at all about the Robinson Collection. Since then through viewing exhibitions and being involved with the gallery I have learned that it is a collection of over 20,000 sets of photographic negatives taken in and around Devonport between the 1920s and 70s by father and son Bert and Albert Robinson. It has been regarded as a comprehensive visual record of Devonport’s history. This information while correct can also be misleading in the sense that it can wrongly imply that the Robinson Collection is an example of work by documentary photographers; a form of photography described as “a style of photography that provides a straightforward and accurate representation of people, places, objects and events.” The Robinson Collection is mostly comprised of studio photography. The Robinsons used photography as a business therefore only those who could afford to pay for photographs could have them taken. Already this creates obvious gaps in the culture and environment represented in the collection. There is little to no representation of anyone who likely couldn’t have afforded to have their picture taken. When I was invited to be involved in the youth takeover project I was mainly interested in seeing the collection first hand rather than just a few select images in an occasional exhibition. Even though I barely even made a dent in the collection in regard to looking at it I noticed that it isn’t as comprehensive as I once thought. While searching through the thousands of delicate negatives I realised there are a lot of holes in the supposed visual records of Devonport’s history. While it remains a brilliant historic resource for Devonport it is by no means complete. For the Youth Takeover exhibition I’ve decided to draw attention to the aspects of Devonport’s history that are not represented by the collection. For example, stories that have the beginning documented but the ending is absent. An example of this is in the many images of world war two soldiers that I came across originally by looking through the catalogues of past Robinson exhibitions. There are over 70 portraits of soldiers before they went to war, but the collection is lacking in images of after the war. There are no returned soldiers, no photos of hospitals, no indication of the physical and mental scars such a conflict would have caused. I have selected a number of portraits to exhibit. These portraits were selected randomly from the 70+ soldier negatives as I’m not interested in representing specific people but rather the lack of the second half of these peoples’ stories. The portraits are displayed in three rows, but I have deliberately cut the third row short to represent the missing piece of the story. Many of these men and women are young and almost all of them would have had families that they left behind. I’m interested in raising questions like did these soldiers return from the war? If they did, were they injured physically or mentally or both? What happened to the families they left behind? Why wasn’t it documented in the Robinson collection? I hope the unfinished third row will help to highlight the missing pieces in this collection. If I was to ask anyone familiar with the Robinson Collection to describe to me what it was, I believe most would say it is a collection of historic black and white photographs. This has been the public face of the Robinson Collection over the past twenty years, as photographic prints of the collection have been displayed annually in the Gallery. However, as the Curator of this magnificent collection, I would describe it slightly differently. To begin with, I would say this is a collection of photographic negatives – because it is in fact an archive of tens of thousands of negatives, rather than photographs, from the Robinson & Son Photographic Studio. There is something special about archives, which rouses an entirely different experience than viewing fragments of archives, already interpreted, arranged and presented in a museum or gallery. While the photographic prints can be highly evocative, I have witnessed how viewing the archive itself can evoke an entirely different reaction. When the Robinson Collection is described by the period or region it covers, or the number of negatives it contains, it is still somewhat abstract. However, standing in front of row upon row, shelf upon shelf of archival boxes each containing hundreds of negatives; holding original, yellowing Kodak boxes; or catching the distinct smell of the nitrate negatives, has a power of its own. It is only when going to the source of the archive that you can get a sense of the magnitude of this collection, both in its scale and historical value. For each negative selected and displayed in the Gallery, there are thousands of others that have only been seen by a few sets of eyes. My interest as the Curator of this collection lies in what is hidden and what is absent, and the potential of bridging these gaps. As this collection is cared for and displayed in an art gallery, there is a tendency to treat the photographs as fine art objects – particularly when so many are visually powerful and beautiful. However, these photographs were the snapshots of the day when owning a personal camera was rare, and this task lay with commercial studio photographers. It is significant that the Robinsons were commercial studio photographers – their aim was never to holistically capture life in the region, and as such the collection is not a complete or comprehensive historical record. However, I do not see this incompleteness as a shortcoming, but as a starting point with immeasurable potential. What this incompleteness means is that the value of this collection is not limited to the physical archive. This collection already extends beyond the Gallery’s archive. Each of these negatives existed to produce an original print, and these original prints can still be found in countless photo albums and on living room walls across the region. What has become clear to me in considering this incompleteness is that the Robinson Collection is not only an amazing resource for the community, but likewise, the community are an invaluable resource for the Robinson Collection. These photographs capture snippets of a time now passed, but the knowledge of those times lies in the experiences and memories of those who lived them. As such, I have begun a project which aims to strengthen the connection between the Robinson archive and its community. Traditionally, a Curator will select pieces from a collection for display in a gallery, and community members will visit the gallery to view the selected pieces. My aim is to disrupt this linear approach, so that the archive itself becomes more accessible, and the gallery is as much a site for the community to share their knowledge as it is for gaining knowledge. This desire is taking form in the design of a series of collaborative curatorial experiments under the banner of ‘The Robinson Project’. The first iteration, this exhibition, is titled In Your Words. This exhibition has been the first step in connecting members of the community directly with this archive: members of the community who lived and worked in Devonport and its surrounds in the period the Robinsons were photographing, whose knowledge and memories of this period are invaluable – and need to be recorded. As I mentioned earlier, for every photograph displayed, thousands are not. It is important to critically examine what is shown, what is not, and how this process of selection could be approached differently. As such, for this exhibition I engaged nine members of different parts of the community, and their stories, as the starting point: simple stories from each about their lives and experiences in Devonport, which will be beautifully familiar and nostalgic for some, and a unique insight into a time now passed for others. After sharing these stories, each went through the archive to find photographs to pair with these stories; photographs which then played their own role, eliciting more memories and details to add to the richness of the stories told. The experience of approaching the collection in this way, through the stories and perspectives of those who lived the archive, reinforced for me the limitations of individual curators such as myself speaking on behalf of the collection. There are countless simple, but important examples. If it were not for this process, I would have believed the Fruit Palace was simply a fruit shop – a reasonable assumption given the window display of fruit in the photograph. Without speaking with Judy and Joe I would never have known that there was a milk bar out the back that was the place to be for local high school students on a Friday night in the 60s. Similarly, without speaking to Janice about the fire station or Arden about the Haines whistle, I wouldn’t have any awareness of some of the sounds of Devonport which could never be captured in a photograph – nor would many others viewing these photographs. The experience of gaining different perspectives on life in the region is also an invaluable result of this approach. This could be as simple as two perspectives of the same photograph or event, such as the Devonport Show, which Bill called for 17 years, and Stephen recounted attending as a child. Or more broadly, insights into the different experiences of Helen in East Devonport, Pat in Quoiba and Jim in William Street, who despite the differences in their childhoods each vividly recounted fond memories of Saturdays spent at the Star Theatre. Each of these personal recollections are made more vivid because of the Robinson photographs, yet also bring these images to life in a new way. As you walk through the exhibition or read through the following pages, viewing these Robinson images and listening to the voices of those who have shared their stories, I hope you too are moved by the power of these simple but beautiful stories, and see the potential that lies in activating this archive as a site of shared memories, stories and the self-representation of the people of this region. Come and visit our creative space to see the new display of artworks made in response to the exhibition tidal.18. Collages were made by our Tuseday and Wednesday nights Create and Make classes, as well as by grade 2 students from Our Lady or Lourdes Catholic School. Many students from Our Lady of Lourdes went back to school and wrote about their artworks , and these statements have been included in the display under each artwork. They are an absolute treasure to read! It is obvious, the local community is greatly attached to the Gallery at Stewart Street. I have been asked countless times why it needs to move. The saying goes, “if I had a dollar for every time I was asked.” The answer is quite simple. Undeniably, the Stewart Street Gallery is a striking building with outstanding features such as the vaulted ceiling, but it is severely lacking in the most practical aspects for an art gallery. When receiving one recent exhibition, Play On: The Art of Sport / Ten Years of the Basil Sellars Art Prize, two of the crates did not fit through the door. To make matters worse it was raining. Unpacking crates on the street is not a good look at the best of times and is simply out of the question in the rain. Stewart Street has no loading bay on the street frontage, let alone attached to the building. Delivery vehicles hope that there is an empty space out the front or risk a fine by parking in the bus zone. There are no amenities in the building and patrons are asked to use the public toilets outside. There is no storage and the entrance would be non-compliant by today’s standards. Unseen by patrons, is the cramped office environment that is either sweltering in summer or freezing in winter. When I worked at the Gallery in 2009, a feasibility study was being undertaken for an extension. This was not the first study. Vast improvements have been made to the building, but not to the extent to resolve some of the fundamental requirements for a regional gallery. Stewart Street has approximately 140 square metres of floor space and with the built alcoves out of ‘temporary’ walls, has approximately 70 running metres of running wall space. The new Gallery will have just on 300 square metres of floorspace and approximately 116 running metres of wall space. In addition is a 60 square metre room we are calling the Creative Space. It is a serviceable space to conduct workshops, hold meetings or use an exhibition space if necessary. I have the pleasure of wearing a hardhat and safety vest to undertake a fortnightly site-visit. It makes an arts and culture guy feel rather manly. Each time I visit the construction site I get a better sense for the space. Last week the walls were lined. Soon it will be painted throughout. Then the carpet, joinery and finishing touches. We will open on Friday 2 November with the opening of Tidal: City of Devonport Art Award. I cannot think of a more appropriate exhibition. Tidal is a highlight of our calendar that brings some of the most interesting contemporary work from throughout Australia to public view in Devonport. The exhibition responds to the theme of tidal coastal living, characteristic of our region. We will also be opening with an exhibition from our Robinson Collection. Our Curator Erin Wilson has been working diligently to collate a series of fascinating oral histories in relation to images from the Robinson Collection. In Your Words: The Robinson Project contains over 100,000 photographic negatives capturing the social and commercial life in the region during the 20th century. It has opened this extensive collection to members of the Devonport community, who have explored the archive, selected negatives that resonate with them, and recorded oral histories elicited by these photographs. In Your Words exhibition will bring together thirty photographs selected by nine members of the Devonport community, presented alongside oral history excerpts, both text and audio, through which they share their memories and stories of the region, in their own words. I am looking forward to the move. It will bring together staff from our Gallery, Theatre and Visitor Information Centre into the one building and operation. It will result in a team of people capable of delivering unknown potential. The possibilities for the future look very exciting. Guest post: Dunja Rmandić, Former Curator of Collections, Devonport Regional Gallery. A few years ago when I came to Devonport for my second interview for the position of Curator of Collections, I was greeted at the airport by a small curly haired woman, Ellie Ray, driving a huge white van. The contrast was stark but I quickly came to realise that Ellie’s task at the Gallery was, like the van, huge. She needed a Curator to help her relocate the whole collection to a brand new facility. Ellie had lobbied for this new facility and ran the whole process steadily and diligently for a number of years, because she knew that the Devonport collection was a special one, and it needed to stay that way. When I saw the facility I knew Devonport Regional Gallery was going to be the envy of Tasmanian and other regional galleries. And so it was. Ellie went part time to get a curator dedicated to this relocation project. I think she was the only part time director in Australia, and was still doing her job in the same exceptional way as before. She knew how important it was to do the relocation with a dedicated focus and it is because of her foresight and determination that Devonport’s collection is in the best possible facility for us and for future generations. Ellie didn’t stop there and in amongst securing excellent exhibitions from the mainland and generating exceptional ones herself (Felt Presence was both stunning and important, as were many others), she kept thinking about the longer-term future for the Gallery. And she did that on her first day at work when she pulled down the hessian walls all those years ago! I have worked in quite a few places but Ellie is the best Director I have worked under. Her genuine dedication to the local community, above and beyond all else, above and beyond ego, made our jobs easier, better focused and deeply meaningful. You knew why you were coming to work every morning but most of all you knew that everything you do, be that installing exhibitions, putting on a Friends’ lunch or printing invitations, must be done with the utmost professionalism and highest of standards. When you did turn up to work, you would hear Ellie signing in the kitchen or in her office or while changing the lights on the giant ladder. This is what I love the most, this combination of professionalism and warmth with Ellie, and though she may occasionally lose a piece of jewelry or leave her phone at home, don’t let that fool you, she’s sharp, energetic and determined; know that the Gallery is losing one of the best arts professionals in Tasmania. 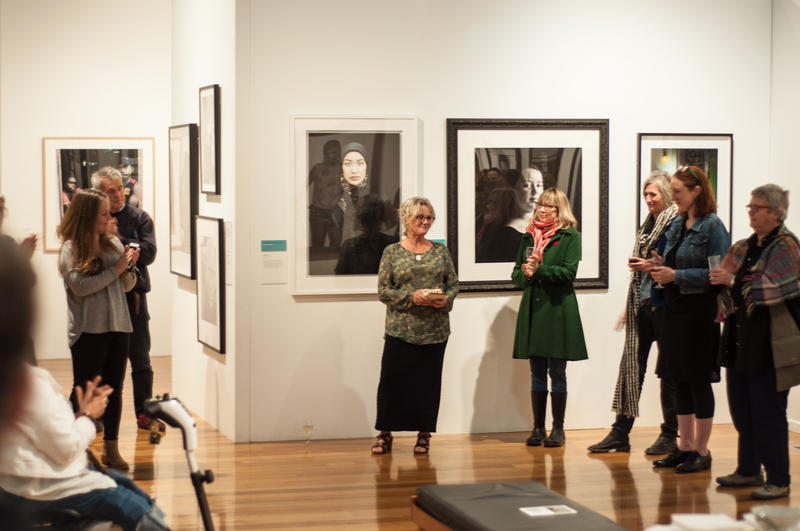 In my mind Ellie had long ago joined the Devonport greats Jean and Daniel Thomas; her knowledge and deep engagement with ideas and art are infectious and her deep love for the collection and Tasmanian art are inspirational, the testament to that are the annual Robinson Collection shows. How great have they been? I am sorry I can’t be there to celebrate this moment with you Ellie, but I’m sure I’m not alone in wishing you all the best to you for the next chapter of your creative endeavour, and from the bottom of my heart thank you for the best two years of my professional life. Paul Boam was born in Derbyshire, England in 1938. He remembers having a desire since childhood to be an artist, though not coming from an artistically inclined family. Instead, Boam attributes his interest in art to his being frequently ill as a child, yet being able to draw and paint while alone. Boam went on to train at the Nottingham School of Art where he found himself surrounded by like-minded people, and discovered artists such as Piet Mondrian and Paul Klee who stimulated his fascination with geometry. Following his studies Boam moved to Tasmania, where he remains based today, and began teaching at the Tasmanian School of Art in 1964. Boam is known for his abstract paintings, which although often highly structured, also frequently contain elements of movement and fluidity, through the organic components often found in his grid-like structures. These organic forms are drawn from the themes Boam explores in his paintings; namely the Tasmanian landscape and its more abstract elements, such as considerations of light, and the weather events like bushfires as subjects. The artist has stated ‘The landscape almost always plays a part in my work but as a feeling, a sense of place, rather than a depiction.’ He has described his early works as ‘very tonal’, as they were based on more industrial landscapes than his later works. This shift demonstrates how the adjustment to life in Tasmania and its natural vistas impacted Boam’s practice. The artist also credits his teaching role at the University of Tasmania, which focused on colour theory at this time, as having played a vital role in the changing direction his practice took after moving from the UK to Tasmania. Boam’s exploration of the Tasmanian landscape is neither strictly literal or figurative, rather his works often explore more ephemeral natural qualities such as light. Usually, Boam has undertaken these works in the studio, but at times he has also worked directly from the landscape. Although primarily recognised as a painter, Boam’s practice is more diverse. He has considered drawing to be a fundamental part of his art making process, this becoming apparent through paintings such as Untitled (1971) and Song before Sunrise (1980) from the DCC Permanent Collection. These works and others like them have distinctly structured geometric designs underlying the more fluid, overlying paint. In this way, Boam’s paintings walk the line between formal abstraction and a more expressive painting style. Boam’s practice has also seen a material change over a period of several years, following a diagnosis with cancer which has limited his ability to work at an easel. The artist has since adopted the medium of collage as an alternative to painting, which has allowed him to continue to explore the concepts that formed the basis of his painting practice, while experimenting with the potential of this new medium. These collages sustain Boam’s distinctive style of abstraction while also containing more figurative elements, albeit often comprising disjointed details. Edith Holmes was born in Hamilton, Tasmania in 1893. While spending the majority of her life living in Moonah, Hobart, Holmes grew up in Devonport as the third of five children. Both of her parents were teachers; her father William N. Holmes a schoolmaster from Ireland and her mother Lilla Edith Homes a Tasmanian-born school teacher. Edith’s father had abilities in calligraphy and drawing, and Edith also showed an interest in art from an early age. It has been suggested that her first painting tutor may have been Annie Cocker, who is also represented in the DCC Permanent Collection. Holmes later continued her art studies at the Hobart Technical College, where she completed a year-long course titled ‘Still Life Oil Painting’ in 1918. From 1930 to 1931, she studied at the Julian Ashton School of Arts in Sydney, alongside George Lambert and Thea Proctor. During the 1950s and 60s, Holmes travelled overseas, where she was exposed to new artistic influences. She would paint throughout her life, from her first documented work Still life with strawberries (1906), continuing into the early 1970s, shortly before her death. As well as notable artist, Holmes was widely recognised as a philanthropist and environmentalist. The DCC Permanent Collection holds nine works by Holmes, seven of which are portraits. While painting across portraiture, landscape and still life, in her later years Holmes focused more on portraiture. It is undoubtedly her portraits for which she is best known, and over the years Holmes’ paintings were included in eight Archibald Prize exhibitions. William Holmes, depicted in the two paintings above, was Edith’s father. The portrait on the left was included in the 1935 Archibald Prize, the first of the artist’s works to be accepted into the exhibition. William Holmes was a school teacher, who migrated to Tasmania in 1881, and he was known as a strong athlete, particularly in cricket. This portrait was displayed in the dining room of the family home Dilkhoosha, where Edith usually painted. There are four known portraits that Edith painted of her mother, Lilla Edith Holmes, three of which survive, and two of which (above) are held in the DCC Permanent Collection. Edith’s mother had five children including Edith, and worked with her husband William as an assistant teacher. She was said to have a keen sense of colour, and to be very supportive of Edith’s artistic pursuits. Joan Dabrowski, depicted in the portrait on the left, was Edith’s niece. Joan’s mother died when she was young, and following her death Joan spent a substantial amount of time with Edith either at Dilkhoosha, or out sketching, and the two remained close in the later years of Edith’s life. Patsy Adam Smith (1924-2001), depicted in the portrait on the right, was a celebrated author who grew up in regional Victoria, and would at times stay in Hobart while working as a trading vessel radio operator. The Devonport Regional Gallery is currently situated in a re-purposed Baptist Church. It is a stunning building complimented by engaging exhibitions, programs and events. However, we have outgrown the building and next year we will say ‘farewell’ to Stewart Street when we relocate to Rooke Street. The new location is yet another old building, the former Devonport Court House. The Court House was opened in 1903 and has undergone both minor and major alterations and additions since that time from 1939 to 2000. Birelli Architects have determined to remove several of these additions to the building in order to revitalise and expose many of the original features and combine them with contemporary materials to create the new galleries. The two-story building will house a ‘touring’ gallery downstairs, and a ‘collection’ gallery upstairs. The smaller upstairs gallery will be used for emerging Tasmanian artists exhibitions and exhibitions of children’s artwork. Work on the new gallery is due to be completed by mid 2018. Other areas will house education and public programs, a gallery shop, offices and a curatorial work space. As work commences on the new gallery, we will post regular updates and photographs. Meanwhile, exhibitions and related programs will continue to be presented in the current building until the relocation in 2018. Currently we are hosting the 2017 DRG Solo Commission by Troy Ruffels, ‘Between Fire and Flood’ which continues until Sunday 22 October. Michael Schlitz is a Tasmanian printmaker, who lives in the Huon Valley. He studied a Bachelor of Creative Arts at the University of Southern Queensland, and a Bachelor of Fine Art (Hons) and Master of Fine Art at the Tasmanian School of Art, University of Tasmania. Schlitz is an artist whose lifestyle, practice and artworks each sensitively engage with ideas about our relationship with nature. As with many Tasmanian artists held in the DCC Permanent Collection, Schlitz explores the natural environment through his work, however his approach is distinctly holistic. The artist lives and works in relative seclusion, and often without luxuries such as electricity and running water, and the influence of this sustainable, low impact lifestyle is evident in his work. Through his prints, Schlitz engages with the emotions humans experience in nature, particularly in isolation. These range from our psychological connections with our natural surrounds, as places of quiet contemplation and revelation; our tentative wariness of untamed landscapes; and our continual, communal disregard for the fragility of nature and the impact we have upon its systems. In this way, Schlitz’s work is both highly personal, and politically significant. The lone, secluded figure is often the subject of Schlitz’s works, including Explore the Sea II 1998-99, held in the DCC Permanent Collection. In this work, the figure is only partially visible. He leans forward, his stance emulating the exploration referred to in the title, which also gives the only other hint as to his surroundings. The image is separated into two halves, which are placed out of alignment, leaving the figure disjointed. He is also only partially visible, most significantly his head remaining outside of the frame, placing the viewer at a voyeuristic distance from this explorer’s scene. The thick, black outline of the figure in this work, along with the simplistic form and muted colours, reflect Schlitz’s distinctive style. His works have a raw quality that is echoed in the artist’s relief woodblock printing process. Schlitz prints by hand, and often on a large scale. He draws his forms on to the woodblock with a water based ink, before gouging a series of parallel lines across the surface of the block, using only a v-gouge as a tool. This process gives the image a unique textured appearance with a breadth of tones, rather than placing a distinct emphasis on positive and negative spaces. Schlitz has discussed the complexity that can come from working simply, and how it can be difficult to reduce an idea to a simplistic form; a philosophy which he applies both to the composition of his works and his printmaking process. Schlitz has also referred to this process as being a meditative experience, and viewing and contemplating his works can elicit a similar response in viewers.